At Jamberoo we presently run a booking sheet for all members who wish to play in a competition and also for making cart bookings for these competitions. With improvements in technology this will change and an on-line booking sheet may be available for your use. However this only will be available sometime in the future so members are reminded of the 2018 conditions of play which can be viewed on the club website under the ‘More’ tab in the ‘notices and downloads’ section. Saturday competitions are members’ comps and priority in bookings will be extended to members. For Saturday competitions, all time-slots (except for those 5 pre-purchased spots) become available to members at about 5pm on the Wednesday, ten days prior to the event. For members present at the Golf Club at this time a draw will be made for first choice of available time-slots. The time sheet is then available at the Golf Shop on Thursday morning where bookings can be made in person or by phone. Wednesday time sheets become available at the start of competition on the Wednesday prior to the competition. Members may book themselves and a maximum of three others into the one time slot. Telephone bookings will not be taken until later in the day. Full details of members and especially visitors are required. (Name, Member No, cart hire required, and for visitors, Club, Handicap & Golf Link Number). If you require the use of a motorised cart then this should be noted on the time-sheet. Failure to do so may result in your missing out depending on bookings for the carts on the day. Do not assume that a cart will be available. If for any reason you cannot attend your tee time please contact the starter as soon as possible so that your place can be re-allocated to another member. Do not make bookings if you are aware that you will be absent on that day. Players must report to the Starter 15 minutes prior to hit off and are under the control of the Starter”. Please follow these simple steps to let the starter efficiently accept your payment and hand you your score card and cart keys. Our volunteer starters try their best to respond to your requests and wishes but it is difficult if you come in late or without phoning in advance expecting a cart when they have all already been booked or if you change your booking at the last moment. Please phone the starter on 4236 0404 well in advance to find out if there are spots available, if any carts are available or if you can’t make it. Shop volunteer, Phil Gosling, had an interesting occurrence last Saturday. Apparently Phil hit his second shot into the hole on the 1st. Unfortunately for Phil he was playing the third at the time. 2019 Rule – Taking relief from a plugged ball in the general area of the course. On the 1st January 2019 the amendment to the Rules of Golf come into force. Click here for a full listing of the changes. Rule 16.3 will allow relief for a ball embedded anywhere in the “general area” (that is, the area currently known as “through the green”), except when embedded in sand. In taking relief, the player will drop the original ball or a substituted ball within one club-length of (but not nearer the hole than) the spot right behind where the ball was embedded. To paraphrase an old Queensland advertisement … “Jamberoo, windy one day, even windier the next”. August winds, you have to accept their challenge and enjoy your game regardless! Not that the wind affected the scoring of our competition winners this week with George Goor scoring a massive 45 individual points on Wednesday along with his playing partner William Perry who fired a good 42 points. It often happens that if one player fires then another in the group also goes well. John Lacey also scored 42 points on Wednesday. On Tuesday the wind was relentless and the Ladies, playing a Canadian Foursomes, all seemed to enjoy their game despite the wind if judging by the smiles on their faces when they completed their round. On reflection, perhaps they were grimaces. 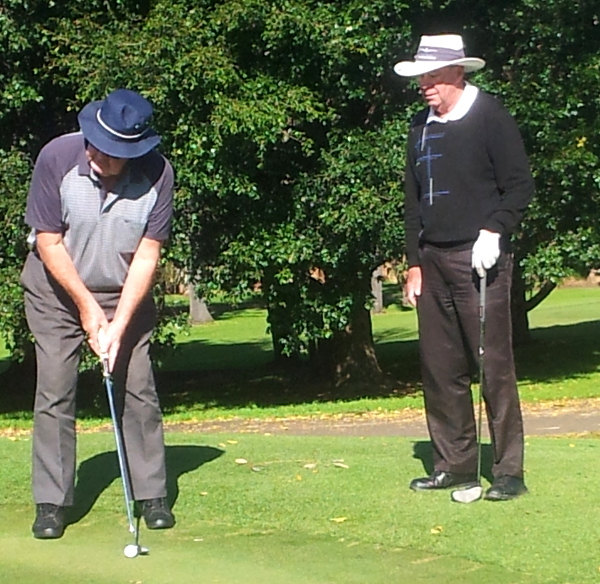 Monday saw our second Veterans stableford of the month and Bill Little was the winner with a good 41 points. Thursday saw the inaugural playing of the 9 hole stableford with the ladies leading the scoring with Judi O’Brien’s 21 points the best. Congratulations to Marie Farrant and Pat Paris on their Mixed Foursomes Championship victory in the hurricane on Sunday. Thanks to our Volunteers – the club wouldn’t be the same without you.